During the Druid War, Calastia's faithlessness almost brought disaster upon the Divine races. Today, under the despotic rulership of the crafty King Virduk, the land of the Black Dragon once more threatens the peace and stability of Ghelspad. Greedy for land and power, Calastia has conquered or subverted all surrounding kingdoms, reducing them to vassal-states. Virduk remains as powerful and cunning as ever, but now he is aided (some would say controlled) by his beautiful young queen, Geleeda, who is, it seems, every bit as scheming and corrupt as her husband. Only a handful of heroes might stand against Virduk's legions. 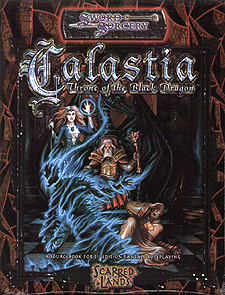 Calastia: Throne of the Black Dragon shows exacty how formidable a foe this realm can be.